Lockheed Martin was awarded $5 million for phase one of the Air Force’s procurement process for future GPS III satellites. Over the next 26 months, the company will demonstrate the value of a modular design for the positioning constellation. This process is part of the Air Force’s GPS III Space Vehicles 11+ Production Readiness Feasibility Assessment. The goal is to take the current block, which, according to a release issued by Lockheed Martin, is already the most powerful positioning satellite ever built, and add modularity and on-orbit re-programmability to add new signals or missions—a first for the famed constellation. One of the requirements the Air Force has for future blocks is that of Regional Military Protection, allowing them to direct more capability to specific contested and challenging environments. According to Lockheed Martin, the spacecraft’s modular design will allow the company to provide low-risk, easy insertion of new and future technology into the production line. The company hopes to demonstrate the value of this flexibility over the course of the next 26 months. The company is contracted to produce the first eight of the GPS III satellites. The first of which is expected to launch sometime in 2017 and at least one satellite will launch atop a SpaceX Falcon 9 rocket in 2018. It is part of the next generation of the constellation, aimed at replacing many of the already orbiting spacecraft. They are designed to be more secure, accurate, and reliable than previous blocks, with an accuracy to within one meter. Additionally, GPS III will provide the military with up to eight times the improved anti-jamming capabilities currently available. The satellites are expected to have a life of at least 15 years, 25 percent longer than the current Block IIF satellites. GPS III is planned to operate at an altitude of 12,541 miles (20,183 kilometers) in six orbital planes at 55 degrees inclination. The Block III design uses Lockheed Martin’s A2100 bus structure, which is manufactured by Orbital ATK. Additionally, each satellite will carry eight deployable JIB antennas, which are designed and manufactured by Northrop Grumman Astro Aerospace. In 2013, the company completed a preliminary design review for two of the key requirements for GPS III: The accuracy-boosting Laser Retroreflector Array, and the hosted payload for search and rescue missions. 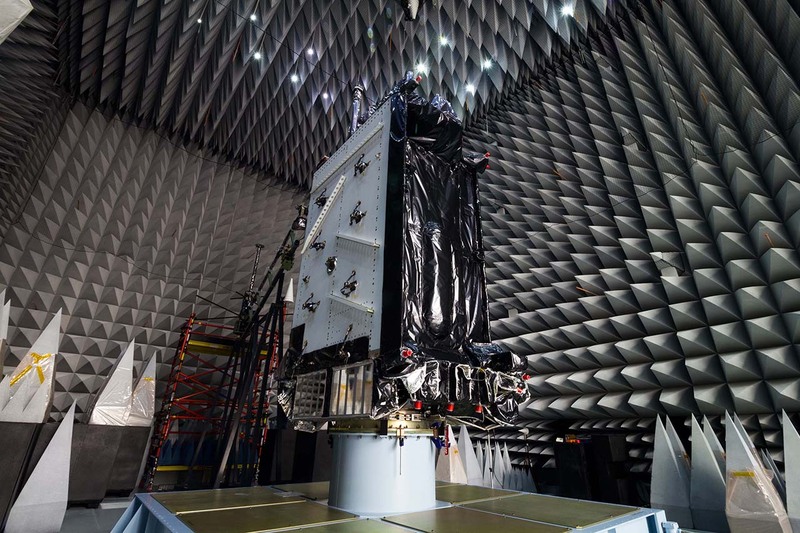 In December 2015, the first GPS III satellite underwent system-level Thermal Vacuum testing, validating the company’s design and manufacturing process. A total of eight satellites were ordered and will be produced in Denver. Stewart credits the Air Force’s previous investment, the Back to Basics program and the prototype known as GPS III Nonflight Satellite Testbed (GNST) for much of Lockheed Martin’s progress on the new block so far. In 2013, GNST proved the new block would be compatible with next-generation ground systems and the existing GPS constellation.